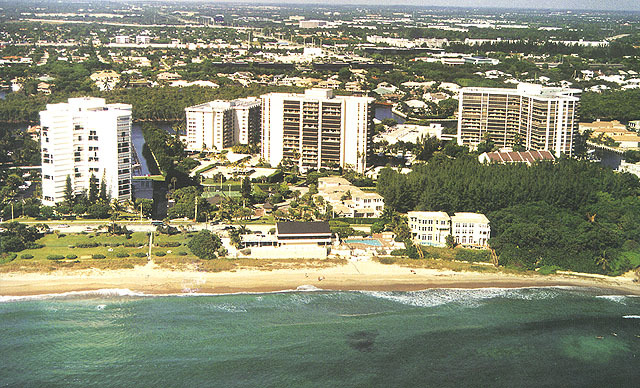 Ocean location: The condo is located in the Boca Highlands, right on the border between Boca Raton and Highland Beach. Neighbors include the Sea Ranch Club and Spanish River Park. The property lies on State Road A1A, and includes several buildings. A beautiful and very comfortable private beach club is available for sunbathing to informal beach BBQs to private dinner parties in a beautiful air-conditioned social room with a view of the Atlantic Ocean. * Other Information about the sleeping facilities: Maximum two adults. Visitors are permitted for 1 week maximum. Bedding includes 1 king size bed in Master Bedroom,1 sleeper sofa in 2nd bedroom and 2 rollaways. A full complement of linens and towels is provided. The kitchen is fully equipped with most cookingware, utensils and diningware. A small table is provided for having meals in the kitchen, in addition to the dining room (dining table seats 6). Living room with wall unit/large size TV. Second bedroom includes sleeper sofa and wall unit with TV. Unscreened balcony: Balcony faces Florida's Intracoastal Waterway and the Marina, making a beautiful relaxing environment. Covered parking next to unit. Covered parking included, plenty of additional parking available. Other amenities not listed above: Amenities include tennis, beach club w/BBQ, Jacuzzi, sauna, exercise room, 2 pools, marina, tennis, minutes away from several golf courses and major shopping malls. The building is quite social and you will likely make good friends during your stay. Click on the picture to be thrilled! *If you are a golf fan, several golf courses are available in the Boca/Delray area. If tennis is your thing, 4 tennis courts are available (reservations required in high season). **If shopping is your thing, newly refurbished Town Center and Mizner Park are minutes away. The building is quite social and you will likely make good friends during your stay. 2 adults maximum, non-smokers please. - Sorry, no children. - Minimum 3 month rental. - Visitors welcome (up to 4) one week at a time maximum. - An inventory of furnishings can be supplied upon request. - Lessees must be interviewed by Association Board prior to occupancy. Interview date will be mutually arranged. (First time lessee at building only). 1 Month Security Deposit for unit, $500 for Building Association.